Just how lawless is FERC, anyway? Doesn’t a member of the U.S. House Committee on Appropriations give them pause? Apparently not. Remember, FERC is 100% funded through charges and fees from the idunstries it “regulates”. However, FERC does get funded up front by a Congressional appropriation that it then pays back (FULL COST RECOVERY, FERC Congressional Performance Budget Request, Fiscal Year 2016). So Congress could refuse to appropriate FERC’s annual $319.8 million budget. What say we get some more Congress members together to do just that? And meanwhile help petition Georgia Governor Nathan Deal to oppose Sabal Trail like he opposed KMI’s Palmetto Pipeline. I am writing to follow up on my letter dated November 4, 2014 to express renewed concerns regarding Sabal Trail Transmission’s (STT) proposed natural gas pipeline through Alabama, Georgia, and Florida, Georgia’s Second Congressional District, which I have represented in the United States House of Representatives since 1993, will be directly impacted by the proposed pipeline, which would travel through Stewart, Webster, Lee, Dougherty, and Mitchell Counties. 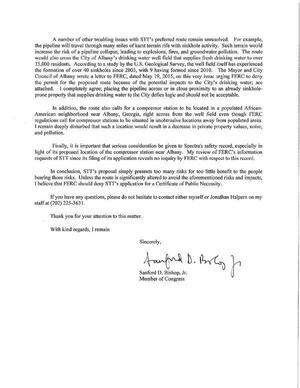 As I mentioned in my last letter, a number of issues have been raised by my constituents concerning the proposed route of the pipeline, the use of eminent domain, the safety record of one of the pipeline owners, and the overall need for the pipeline; to date, none of these issues has been adequately addressed by STT. With regards to eminent domain, my constituents have informed me that STT filed suit against a number of them in order to come on to their property to conduct surveying activities. Resorting to litigation is totally inappropriate and such suits should be immediately dismissed. I therefore am requesting that FERC inform STT and its agents that it must obtain the landowner’s consent before it surveys their property and that STT refrain from any more attempts to use the threat of eminent domain to obtain such consent. I also remain deeply concerned that the pipeline will run through the most populated area of Southwest Georgia with little or no benefit to my constituents. As mentioned previously, most if not all of the natural gas will benefit Florida consumers. The lack of public benefit for and necessity to Georgia residents just led the State of Georgia, through its Department of Transportation, to deny a similar certificate of necessity and convenience to Kinder Morgan for its petroleum pipeline through eastem Georgia; the same logic applies to STT. It may make more sense to allow the pipeline to run through the Florida Panhandle by either co-locating it with the SGT pipeline already in place or, better yet, coordinating to upgrade that pipeline just as it is doing with the Transco pipeline in Alabama. Another option is to co-locate with the existing Gulf of Mexico pipeline, which would avoid impacting any private landowners and eliminate damage to land-based environmental resources as well as the health and safety risks of constructing and operating in sinkhole-prone areas. In both cases, the state of Florida’s residents, who would presumably be getting the benefit from the gas, would appropriately bear the burdens. 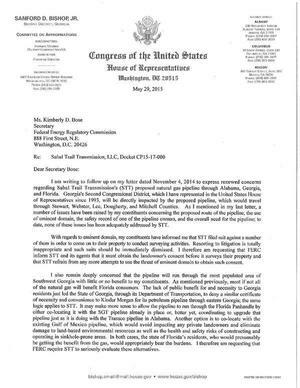 I therefore am requesting that FERC require STT to seriously evaluate these alternatives. A number of other troubling issues with STT’s preferred route remain unresolved. For example, the pipeline will travel through many miles of karst terrain rife with sinkhole activity, Such terrain would increase the risk of a pipeline collapse, leading to explosions, fires, and groundwater pollution, The route would also cross the City of Albany’s drinking water well field that supplies fresh drinking water to over 35,000 residents. According to a study by the U.S. Geological Survey, the well field itself has experienced the formation of over 40 sinkholes since 2003, with 9 having formed since 20l0. The Mayor and City Council ofAlbany wrote a letter to FERC, dated May 19, 2015, on this very issue urging FERC to deny the permit for the proposed route because of the potential impacts to the City’s drinking water; see attached. I completely agree; placing the pipeline across or in close proximity to an already sinkhole— prone property that supplies drinking water to the City defies logic and should not be acceptable. In addition, the route also calls for a compressor station to be located in a populated African-American neighborhood near Albany, Georgia, right across from the well field even though FERC regulations call for compressor stations to be situated in unobtrusive locations away from populated areas. I remain deeply disturbed that such a location would result in a decrease in private property values, noise, and pollution. Finally, it is important that serious consideration be given to Spectra’s safety record, especially in light of its proposed location of the compressor station near Albany. My review of FERC’s information requests of STT since its filing of its application reveals no inquiry by FERC with respect to this record. In conclusion, SIT’s proposal simply presents too many risks for too little benefit to the people bearing those risks. Unless the route is significantly altered to avoid the aforementioned risks and impacts, I believe that FERC should deny STT’s application for a Certificate of Public Necessity. If you have any questions, please do not hesitate to contact either myself or Jonathan Halpern on my staff at (202) 225-3631. Appended to Rep. Bishop’s letter were the Albany City Council letter and the Dougherty County Commission letter.